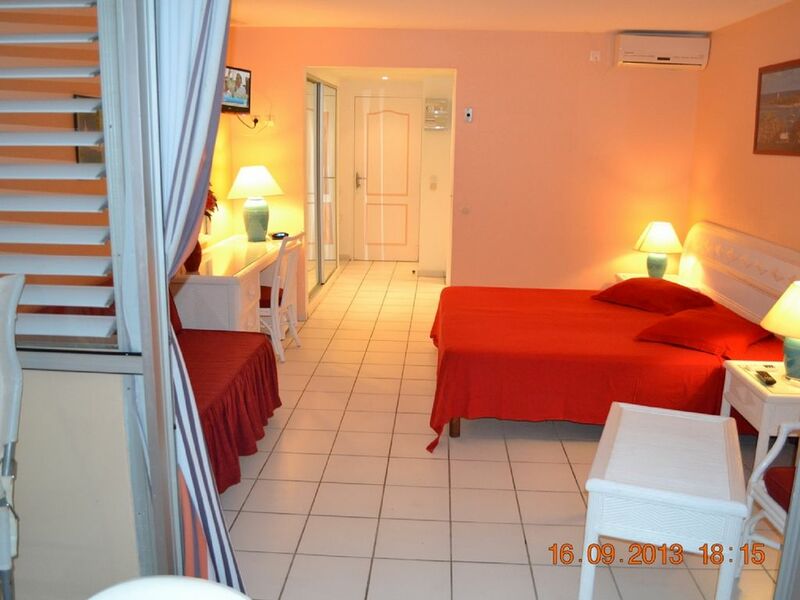 fully equipped apartment sea and beach, luxury comfort in residence with direct access to the quiet beach (20 meters) near the hotel creole beach and spa. close to shops, casinos and amenities. relaxation assured. Degressive rate applicable if several weeks. This apartment is located in Gosier is a small resort composed of several different well-known beaches including that of the islet of Gosier where you can begin to spend the day enjoying the tranquility surrounded by crystal clear beach. In the evening you can enjoy strolling around the busy market town and eat a Bokit (local sansdwich) or good coconut sorbet in the artisan corner .. Let try. We had a great time. The location is perfect both being on the beach and being in Gossier with all the restaurants, grocery stores and near the highway. The price for the studio is also very reasonable. It was clean, had all the needed amenities, maybe a bit outdated. We do not speak French and were worried knowing that English is not spoken here. The owner arranged that we were met at the airport and brought to the apartment. It was really nice. We were given a quick tour of the apartment. Only when our guides left we realized there were many questions that we had and nobody to answer them. Nobody showed up during our entire stay. We tried to text in French and got no answers, emailed owner and did not get a satisfactory answer possibly due to the language barrier. It would be very helpful for non-French speaking guests to have written instructions in English on basic things like where to deposit garbage bags, that the password to Wi-Fi is in all capital letters, etc. Eventually we figured everything out but were a bit frustrated for the moment. Another inconvenience was that we only had one set of keys that limited our ability to be independent of each other. Also we only had one set of bathroom towels and even though there was a washing machine we did not know how to use it and were afraid that towels will take long time to dry and we will not have them when needed. The studio description on the site said that there are beach towels but we only found something that may serve as beach towel (a blanket from AirFrance). Having said all that, there were many pluses for this place though. Studio faces North so it was never hot due to sun, airconditioning worked great, Wi-Fi is great, value for your money, parking spot, proximity to the beach. Overall, we enjoyed our stay and loved Guadelope. Thank you. Appartement nikel et bien placé . L'appartement est très agréable à vivre : déjeuner le matin, face à la mer en observant les pélicans plonger, c'est extraordinaire. Le quartier est agréable : restaurants et petite épicerie de dépannage.Le centre du Gosier est très proche.Il est très facile de partir faire de nombreuses visites dans toute l'île. Un seul petit détail : qu'il serait agréable d'avoir un petit aspirateur pour faciliter un nettoyage journalier ( sable) ! Appartement très bien équipé, tout confort, et idéalement situé ainsi qu’une très belle vue! Les propriétaires nous avaient prévus une corbeille de fruits pour notre arrivée, très gentille attention. Ils sont également très disponibles, mails et appels. Appartement bien situé, calme à notre période. Parking privé appréciable. Notre hôte, Carole est super gentille et arrangeante.